Water is not just for bathing your kids in and applying the best organic shampoo you can get your hands on. It's also there for your little one to learn swimming. Most parents eagerly await the day that they can start swimming with their children. The younger you get your child into the water, the more confident they will be; a trait that will stay with them for life. Safety is a key concern that you must be aware of at all times. Unfortunately, drowning is the leading cause of accidental deaths for kids aged between 1 and 4 in the US. However, there’s one way that you can minimize this risk which will make it virtually impossible that your child could become a victim. Invest in a life jacket. 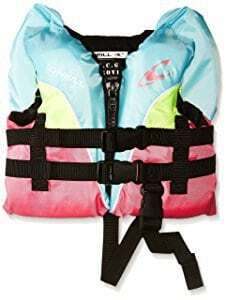 With so many kinds of water activities, there are so many unique life jackets to choose from. Personally, I found this to be a stressful decision without knowing what I was looking for, something you won’t have to go through. This colorful, high visibility life jacket is suitable for younger children aged between 0 and 12 months. This jacket sets out to make it safe to introduce them to swimming or any other water activities from a young age. Multiple straps mean that you can fit this jacket perfectly around your child guaranteeing a comfortable fit. Whether your child is playing in a lake or a pool, or enjoying a boat ride or even just at the beach, you can be sure that your child is always protected from drowning. What's Great About It: As much as we don’t want to think about, accidents do happen and it’s essential that we, as parents, are prepared. With this life jacket, there’s a rescue handle located at the top. In the event of an accident, mom or dad can quickly grab this handle to pull their child to safety. 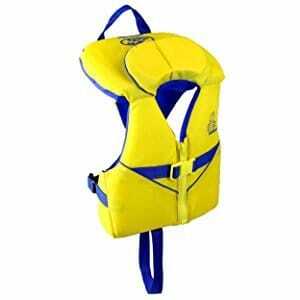 With yellow and blue versions available, this unisex life jacket is ideal for all kinds of water environments. My children have used this life jacket in pools, lakes and while out on a friend’s fishing boat. 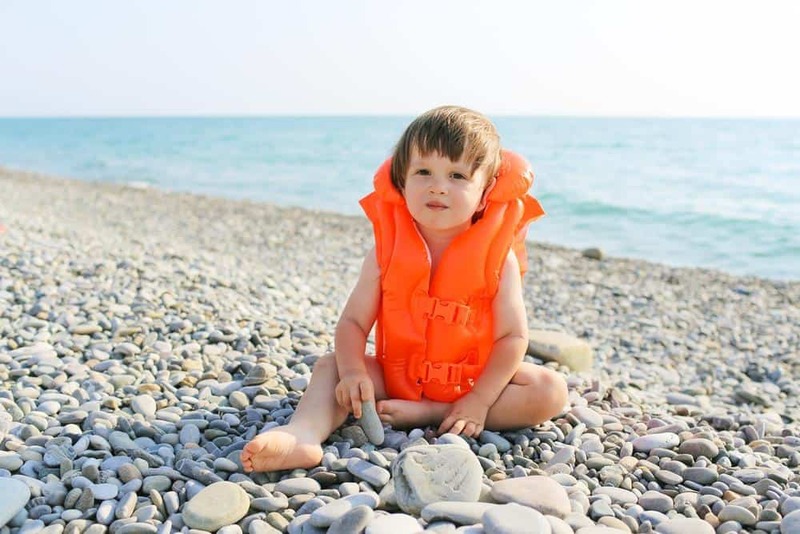 There are no life jackets that are really designed especially for comfort, but this life jacket does try to make wearing it as enjoyable as possible for your toddlers. There’s also an adjustable crotch strap so you can find that ideal fit. The life jacket is so simple to put on because you simply pop it over your toddler’s head, tighten up the straps and you’re ready to go. It’s that simple. What's Great About It: For parents who want to be sure about the security that this jacket provides, there’s also a quick release buckle that’s found covering the entry zipper. This is to make sure that the jacket stays tightly secured and in place at all times. If you’re into water and adventure sports, you’ll be looking for a life jacket that can keep up. All of your needs can be met using this awesome, highly durable life jacket. Firstly, this jacket is suitable for all children 30 pounds and under. Regarding safety, there’s an adjustable safety belt that goes between your toddler’s legs for added support and security. That’s in addition to all of the traditional straps that you’ll find on and around this jacket. The main body of this jacket is made using leading foam Neoprene materials that creates a waterproof shell. This shell is lightweight and durable, everything you’ll need from a life jacket. What's Great About It: Providing extra support for your child, which is especially important when partaking in water sports, there’s additional head and neck support. This comes from the USCG Approved Vest Head that has an integrated support panel and a safety grab loop. 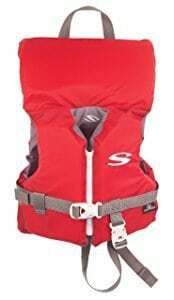 If you’re looking for a great life jacket for your toddlers, but one that’s slightly more affordable, why not take a look at this next jacket by O’Neill. This awesome life vest is similar to the one above, but with a few slight differences. This jacket is made from an extremely lightweight polyethylene foam material. These materials will help your child to stay buoyant in an event where they fall into the water. On top of the jacket’s body, there’s also an extra polyester shell that only adds to these great properties. What's Great About It: Thanks to the integrated head support, if your child does fall into the water, they will instantly float up onto their backs while keeping their heads out of the water. This is an essential safety feature that could save your child’s life. 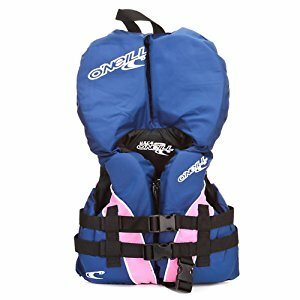 This life jacket is another one of the most popular life jacket options available to you, and is one of the most highly-recommended jackets by moms across the United States. To give you an idea about the quality of this life jacket, it’s been approved for functionality and safety by the US Coast Guard organization. The jacket itself consists of a soft, flexible and comfortable Hydroprene shell as well as Crosstech PE foam that provides the lightness that the life jacket needs to be comfortable. 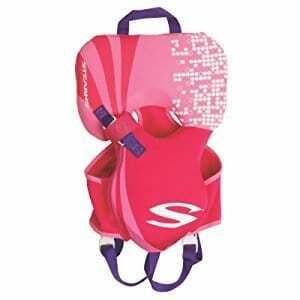 This also provides the buoyancy that will keep your child afloat in water. What's Great About It: In addition to being recommended and approved by US coast guards, my absolute favorite feature is the zippered backs and fronts. These make it incredibly easy to put on and take off this jacket, ensuring minimal fuss when you’re trying to enjoy your favorite beach or lake with your family. Now that you’ve decided that a life jacket is necessary for the activities you and your children are going to enjoy together, it’s time to choose the right life jacket for you. Here are a few things you’ll want to consider. Firstly, your children are going to have an aggravating experience if they don’t feel comfortable while wearing the life jacket. That’s why it’s important to try it out with them before you head out onto the water. When looking for a comfortable fit, look for padded jackets that are lightweight and use soft materials on the inside. As you can see from my list, many of the life jackets are US Coast Guard approved. That’s because these life jackets meet or exceed the life jacket recommendations and standards set out by this organization. As a rule of thumb, if the life jacket you’re looking at doesn’t have this seal of approval, move on to the next. Also known as a ‘grab loop,’ in the event that your child does end up in the water, which can happen from time to time, you’ll thank your lucky stars that you brought a jacket with a grab handle. Commonly known as a ‘crotch strap,’ this is simply a strap that will go between your child’s legs from the front and connects to the back. 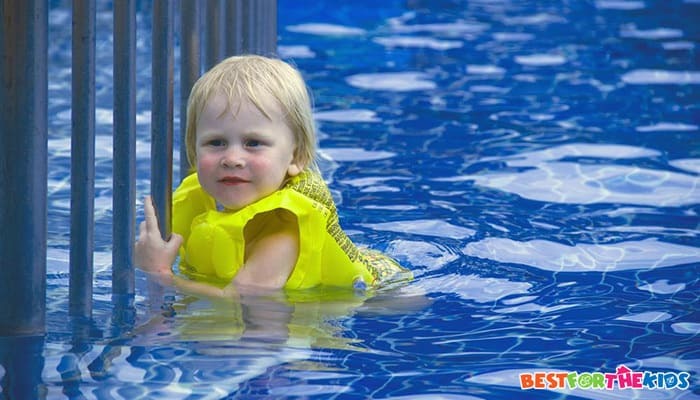 This strap helps to keep your toddler’s life jacket securely fastened to their body. This kind of floatation is crucial on a toddler’s life jacket. This is achieved by buying a jacket with head and neck support. To the untrained eye, this may just seem like an extension of fabric. Some parents think it may be a good idea to save a bit of money and buy a used life jacket online or in a thrift store. However, I highly recommend against doing this. At first, you may think that life jackets are uncomfortable, a bit lumpy and not really necessary. However, this is not something you want to be looking back on with hindsight. At the end of the day, this is your child’s life on the line, and you should rather be safe than sorry.